Сардиния,волшебный остров c жемчужными белыми пляжами еще чистой красоты,длинные песчаные пляжи c бирюзовым морем.Речная растительность можжевеловых деревьев,которые расширяются их разветвленными ветвями и чтобы коснуться песка и розовых фламинго,которые находятся в пределах досягаемости Африки.На этих пляжах с архаичной и тихой красотой мы выбрали несколько домов,который предоставит гостям возможность испытать эти уникальные места в полной гармонии с природой и наслаждаться комфортная и приятная обстановка. Sardinia, a magical island with pearl white beaches of a still pure beauty, long beaches of sand with turquoise sea. The sparse vegetation of juniper trees, stretching their gnarled branches down to touch the sand and pink flamingos resting as they fly to reach Africa. On these beaches of archaic and silent beauty, we have chosen a handful of houses which will give their guest the chance to experience these unique places in perfect harmony with nature whilst enjoying comfortable and pleasant environments. An unique opportunity to purchase a sea skirting villa with beach access. Unique in its setting and design. Elegant villa overlooking the whole coastline. Built on secluded sandy beach. Situated in the most picturesque part of town. Very short distance to beach. Villa RaffaelloView our exciting 5 stars collection! Porto Cervo. Sleeps 12. Private pool. An amazing example of a prestigious villa; built by the famous architect of Costa Smeralda, Savin J. Couëlle. 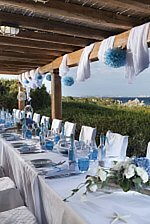 The villa is situated on the hill above the village of Porto Cervo overlooking the bay. See Villa Raffaello | Book now! Sleeps 6. Private swimming pool and sea views. Air conditioning. Short walk to the centre of Porto Cervo Marina, Costa Smeralda. Delightful detached house, situated in a quaint residential setting. The sea so close one can hear the waves at night. 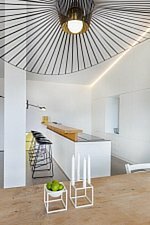 The shades of the sea and of Sardinian nature are evoked by the interior design of the villa, which boast a light linear simplicity fitting so well with this the shades and the forms of the coastline and its landscapes. Overlooking a small garden, the house has a relaxing swimming pool and charming sea views. See Villa Le Calette | Book now! A villa of contemporary design only a stroll to a long white beach with emerald water. 4 bedrooms, air conditioning, private swimming pool. Charming sea view. Wi-Fi. 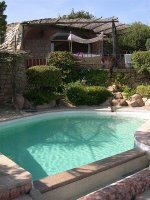 The villa is the most perfect location for travellers who want to explore the quiet beaches and beautiful nature of this part of Sardinia. A kilometres long coast line boasting some of the most striking beaches of this magic island. Quiet neighbourhood of independent villas with great privacy. See Villa Stella Mare| Book now! 15 km South of Olbia. Sleeps 6. Swimming pool. Air conditioning. (щелкните для перевода на русский). A beach villa set in a private location. Charming and modern, it comes with a touch of luxury! From the shady porch one can sit and watch the sea, relaxing at the sound of the waves. Enveloped by a manicured garden with palms, eucalyptus trees and other Mediterranean plants, the villa’s peaceful atmosphere creates an oasis away from everything. See Villa Gineva | Book now! Sleeps 12. On the beach. Near Olbia. Sardinia. Air conditioning. Wi-Fi. A luxury beach house facing a pearl white, sandy beach in an exclusive corner of Sardinia, about 15 km South of Olbia’s International Airport and the Aviazione Generale the Private Jet Airport. A relaxing heaven to unwind and enjoy long summer days in Sardinia! The villa is suitable for families with children as its location is close one or two restaurants and a handful of shops. See Villa Agata | Book now! Alghero. Sleeps 8. Large swimming pool. A short drive to secluded beach. Beautiful period house surrounded by large grounds and a walled garden covered with climbing plants and flowers. The villa borders a olive grove with ancient beautiful trees. The house has a unique charm and will give guests the chance to discover and get closer to the ancestral spirit of this island and its sheer beauty. The countryside covered with olive groves and tall cactus leads gently down to the sea, the beautiful and wild beach of “La Speranza”. See Villa Oliveto | Book now! Coming from the sea, the island of Sardinia offers unusually attractive scenery of granite rocks surrounded by white sand, which gives the water the renowned emerald green color. Landscapes of unspoiled nature have always enchanted the navigators coming to Sardinia. It is on the coast that most visitors remain, enchanted by the fragrant sea air, which tastes of salt, juniper and lentischio. Within short travel distance from their homes they will find dunes of golden sand encapsulated by granite rocks, lapped by the most transparent water and like on the small island of Spargi sand of light pink shades, the fine dust of red corals. No matter if you arrive in Olbia, Alghero or Cagliari. From the emerald water of Costa Smeralda to the salt pans of South Sardinia, where pink flamingoes spend the summer before migrating to Africa, the landscape change yet the enchantment remains. Equally beautiful – the walled town of Alghero with its long picturesque promenade alongside the sea, or Orgosolo, set amongst cork trees in Sardinia's inland, who's murals tell stories of bandits and miners, the unusual charm of these places wins the visitor's heart. Prince Karim Aga Khan was in the 60's bewitched by the beauty of the stretch of the coast North East of Sardinia and decided to buy a poor stretch of Gallura. Porto Cervo with its top luxury villas was created from nothing and with Porto Cervo the extreme luxury of Costa Smeralda, remaining the favorite destination of international jet set. With 1,850 km of coastline, Sardinia, the land of shepherds, arid yet so beautiful, pierced by granite rocks and embellished by the emerald of its water waits silently to welcome its visitors with generous gifts.